…while another person chose to start a fire in the woods. I asked God to help me tame my tongue in order to prevent my hurtful words from catching fire, thus hurting those I love, while a stranger sat back and watched the flames lick the trunk of this old tree with a smile. 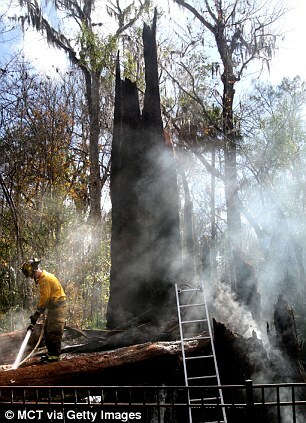 Central Florida has been home to the oldest Bald Cypress Tree in the world. It was believed to be 3500 years old and at one time stood 165′ tall, that is until a hurricane in the 1920’s broke it at the top. President Calvin Coolidge dedicated the park where “The Senator” stood in 1929, and many have visited the old Senator ever since. It was a landmark used by Indians in the past and presently a prized attraction for the small city of Longwood, FL. On Monday morning, January 16th, around 6a. a runner noticed flames shooting from the top of the tree and called the Fire Department. By the time they arrived the entire center of the tree was ablaze, and it was impossible to stop the damage. Within 30 minutes the tree fell, and all who were nearby heard it fall. Sadness stood in its place. As I finished my quiet time with the Lord, this arsonist had finished his devastating work. There had been no lightning strikes in the area, no rain even, so the cause of the fire was a mystery. Until a pile of wood was found at the base of the tree indicating that this fire was started inside the tree where no one would see it until it was too late to stop it. This was believed to be the work of an arsonist. Who would choose to do such a thing? And why? Experts who study the behavior of arsonists say they do it for the thrill and excitement of seeing the damage wrought by their own hands. It sounds so sick, doesn’t it? Yet isn’t it interesting that James chose this exact metaphor to describe our tongue and the words we choose? Having counseled married couples for years we have witnessed the damage caused by hurtful words. We ourselves have used words at times that were obviously spoken to stab and hurt, but never to destroy. Not really! As Tom and I were talking about this at length he said most people when they use jabbing words are merely wanting to fire a warning shot across the bow, so to speak. It’s a warning to back off or more damage will ensue. But sometimes, many times, our first shot makes a strike, and a fire is stoked. It can take a long time to put out the fire, much less repair the charred damage left behind. How conscious are you of the words you choose to speak and why? Have you noticed your spouse back off when you vent? The Bible instructs us about the damage our tongues can cause, but gives us hope in so doing. We don’t have to use such words. We can say NO to this temptation. The grace of God teaches us to say NO to ungodliness, but we must choose to say NO! If we are saying we want a good marriage, but do nothing to bridle our tongues we are deceiving ourselves. Let’s be honest and choose to stop speaking in ways which send off warning shots. If anger is a besetting sin in your life, in your marriage, then we appeal to you to seek biblical counsel from someone you know and trust. When the flames of such words reach their peak, many more will be harmed and maybe all the years you’ve invested in your marriage and in your family will go up in smoke. May it not be said of us! Editor’s Note: Fire Fighters have not confirmed arson at this time, so the cause is still a mystery. We believe the metaphor is still worth posting in regards to marriage, and we thank God, there may not be such an arsonist on the loose. This entry was posted in Christian Marriage, Conflict, Difficulty, Growing Strong Marriages, Temptation, The Gospel & Marriage and tagged Arson, Big Senator tree, Calvin Coolidge, Fire, God, Longwood, Longwood Florida, marriage, Monday, The Senator tree. Bookmark the permalink. Challenging thoughts. Thanks for this. Wow. I need to think of this more. Thank you, Debi! Great connection here. 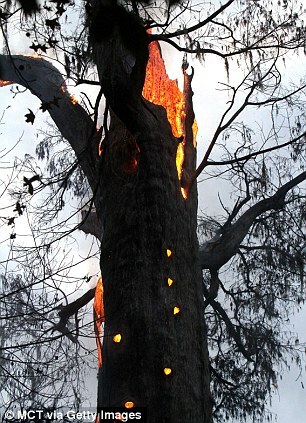 Such a sad story about the tree – even sadder when fire is simmering away from view and then engulfs a marriage. Yes, it’s always good to remember the effect of good words. Thanks! Thank you. Very thought provoking and a much needed reminder.